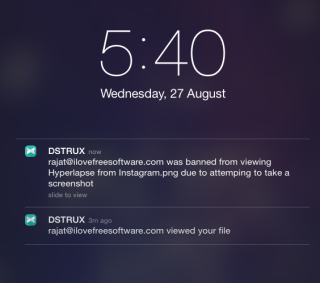 DSTRUX is a free iPhone app to share, control, and self-destruct files over web. 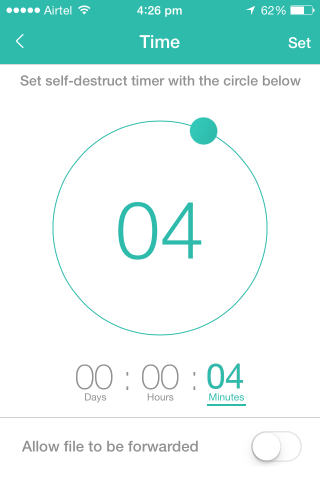 The app gives you full freedom to choose the time interval after which the shared file will be self-destructed. The app also lets you grant/deny file access anytime to recipient, even before the file gets self-destruct. 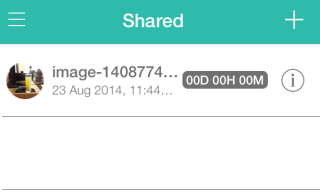 According app’s description, any file shared via this app is first encrypted and then shared. Also, it gets shredded and erased at the time of self-destruction. Apart from just setting time interval and waiting for file to get self-destruct, you can also enable/disable forwarding of file to other users. If you choose to enable file forwarding, then app also notifies you whenever the file is forwarded with anyone else including the information about the person to whom it was forwarded. You can then choose to deny him the access any time. Other than this, no recipient can save the file, print the file, and he can’t even capture screenshot of shared file. If any of the recipient tries to capture screenshot, then he is revoked from his privilege of accessing the file. The app also notifies you whenever the recipient views the file shared by you. The best thing about the app is that you can share files with anyone, no matter they are using this app or not. You can share files via Facebook or email. You have to register with DSTRUX before you can start to share, control, self-destruct files. The app lets you register using either Facebook or registration form. When you complete this process, you will see the home screen as shown in screenshot below. It is the Shared interface of the app from where you can check all the files shared by using the app. To share any file, tap on + icon at top right corner. The app lets you click a new photo, upload file from your iPhone, or from Dropbox. Choose any of the method and then file to share. On selecting the file, you will see the interface shown below for setting the time interval for self-destruction. You can see that it is circle with three labels below it: Day, Hours, and Minutes. 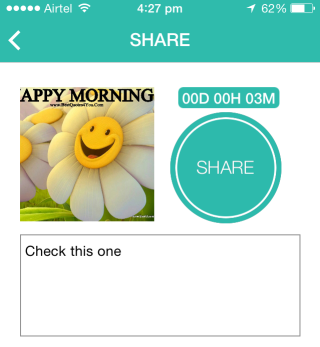 Tap on the particular level to set numerical value for it by moving the Green dot on circle. This circle is like a clock, so when you move it, the numerical value will appear just like in real clock. The option for enabling/disabling of file forwarding is present at bottom of screen. Choose it as per your choice and tap on Set option at top right corner. After this, you can choose to add any optional message with the shared file. Tap on Share option to share the file. The app will ask you to choose the method for sharing: Facebook or mail. Choose anyone, enter recipients name (For Facebook) or email address and that’s it. Your uploaded file is shared. If the recipient selected by you is also registered with the app, then he will receive the file on app, otherwise on the medium (Facebook/email address) selected by you. Whenever recipient will view the file for first time, you will get notification. If he tries to capture a screenshot, then also you will get notification about the attempt. If you receive any file shared by anyone, then you have to tap on its name and swipe on screen to view it. Do remember, you can not take screenshot. If you will try to do so, then you will get a pop-up message as shown in screenshot below. You may also like: 4 Free Self-Destructing Message Sending Apps For iPhone. 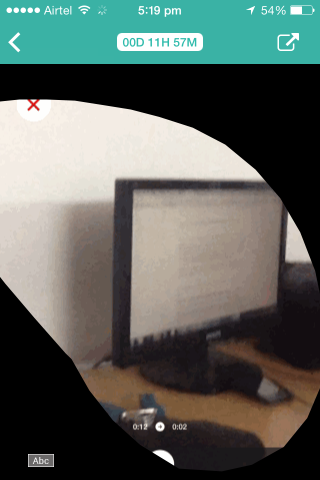 DSTRUX is a really awesome iPhone app to share, control, self-destruct files. I really like the app as it gives you full control over shared file, like enabling/disabling access, setting self-destruct timer, notification for screenshot capturing attempt, and also when recipient views. I am really impressed with this app. If you are looking for a reliable app to share your private or confidential files, then this app is for you.